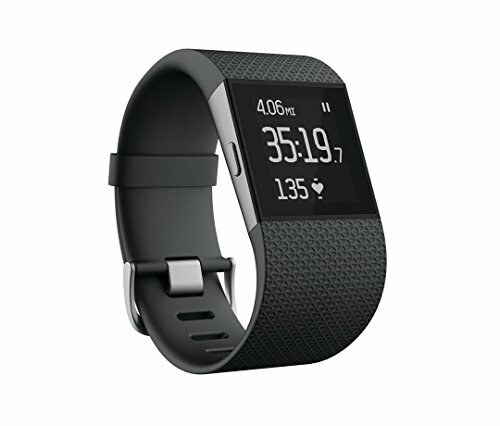 Train smarter with the Fitbit surge gps watch + hr. monitor. This exercise-savvy watch has built-in gps tracking, allowing you to view distance, pace, and elevation climbed, as well as review running routes and split times. The pure pulse heart rate monitor gives you continuous, wrist-based heart rate and simplified heart zones for upping your cardio endurance. Best of all, these stats wirelessly sync with your smartphone for in-depth analysis. No matter your discipline, this watch records running, cycling, cross-training, and cardio, delivering detailed workout summaries with tailored metrics, intensity levels, and calories burned. For improving your sleep, the built-in sleep monitor displays your overnight sleep duration and the quality of sleep, as well as gently waking you with a silent alarm on your wrist. For busy days at work, the display shows your call and text notifications, allowing full control of your mobile playlist when you're on the move.